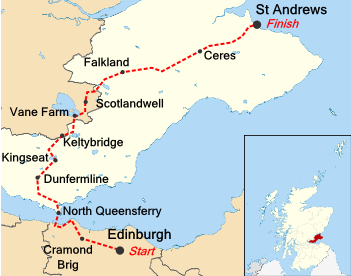 To quote one of our pilgrims: "Today’s walk really gives The Saint Andrew’s Way its teeth". Were the views as he ascended Munduff Hill breathtaking, or was it the gradient? After resting by the summit cairn [456m] we go through a gate and pass a meteorological station in a forest before descending past West Feal Farm. Our route heads across the dam of Harperleas Reservoir and above Ballo Reservoir to Craigmead car park. 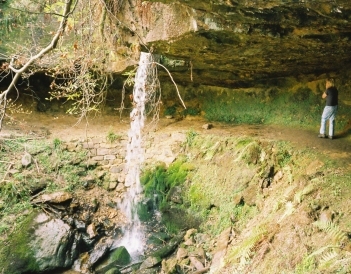 A path to Falkland goes down Maspie Den. A ‘den’ in Fife is a valley. We soon get some surprises: the Way takes us behind the Yad Waterfall; one footbridge over Maspie Burn is itself crossed by another bridge; and a pedestrian tunnel reveals daylight in front of us as panic was about to break out. Visits to flower-bedecked Falkland village are incomplete without checking-out Falkland Palace.